On a trip to Japan that I was lucky enough to take in 2007, my friends and I had lunch at a Tokyo pub called Drunk Bears. The logo for the bar was a sozzled-looking teddy bear, holding a martini glass and leering. And the lunch we ordered was hashed beef rice. It’s a Western-style dish invented in Japan, a kind of diner-style fusion dish. Sometimes it’s called Hyashi rice. Drunk Bears’ version was tangy and savoury and saucy and wonderful, and when I got home I looked for the recipe on the Internet, wanting to eat it again. I found a few recipes. Some seemed too bland; some called for pre-made blocks of Hyashi rice concentrate that were mostly wheat flour, which I can’t eat. So I put together elements from two recipes – one from the Daily Yomiuri, and the other from “Hiromi-o” – and came up with a new recipe, the one in this post. Its ingredient count seems high, but it’s easy to do. Just combine some of the ingredients ahead of time, and you’ll find it goes quickly and easily. A friend in Tokyo, Hasegawa-san, posted a picture of his lunch on Facebook a couple of days ago, and it was hashed beef rice – that’s what got me thinking of this recipe. It comes close to the hashed beef rice we enjoyed at Drunk Bears, but it’s not exactly alike. Maybe it’s a little bit better. I hope you’ll enjoy it. 1. Melt butter in saucepan, add flour, stir and combine until smooth and bubbly. Add tomato juice slowly, stirring, to make a tomato gravy. 2. Add onions, garlic, ground cloves, and meat. 3. Add more tomato juice or some water if mixture becomes too dry or begins sticking to the pot. 4. Cook everything slowly, until the onions are translucent and the tomato gravy is not too browned. 5. Stir in beef stock, soy sauce, Worcestershire sauce, ketchup, balsamic vinegar, additional ground cloves, and red wine. 6. Cook over medium to low heat, stirring periodically, until all flavours are mixed and the sauce is reduced to the consistency you want. 7. Serve over hot rice. 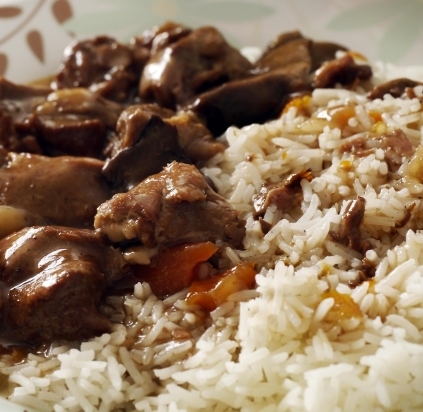 Note: some people like tomato and carrot pieces in their hashed beef rice, as in the photo above. I really like your post. Are you a chef or a foodwriter? Have you thought about writing professionally? 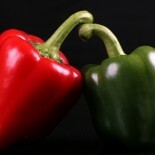 Please take a look at http:\\www.northwestchefs.com\recipes and send me an email if you would consider writing contact. If you like the site please give us a plus. It helps so much and benefit us all. Again thanks and great post. So the onion is not fried? I hate cooking with wine. What can i use instead? Made this tonight! Awesomely yummy!!!! And easy even if you don’t mix stuff up ahead of time. Verrrry nice with sake. I was also thinking that the onions aren’t fried nor is the meat. Does that mean they are boiled? This entry was posted on April 11, 2013 by thinkreadcook and tagged beef, cooking, food, fusion, hashed beef rice, hyashi rice, Japan, Japanese, recipe, rice.